Wow, talk about something a bit different Peter! Really interested to see this develop. I keep wondering what I have lt myself in for!!! I haven't forgotten the MAK 15, but progress is slow, due to other modelling getting done, outside in the sunshine! However, now that summer looks to be coming to an end, I actually got about an hour on the MAK drawing today when it rained for a while, but there's a lot to sort out, as you said. Quite a challenge, all this 30-dimensional thinking, but I might possibly have something to show you soon. I'll PM you with a .pdf for you to look at, comment on, criticise or whatever - once I get a bit further. You have my sincere sympathy!!! I have done my drawings and cut out a lot of the parts. and am now doing dry runs on the centre section and modifying as I go. I still have one or two or three problems to sort out. I will let you have my pdf drawings t look at if you PM me your email address. Right! Building at last. THis one is turnng out to be a bit more of a problem. I keep finding things that are not quite right on the drawing ans also realising that some tchings need changing a bit. 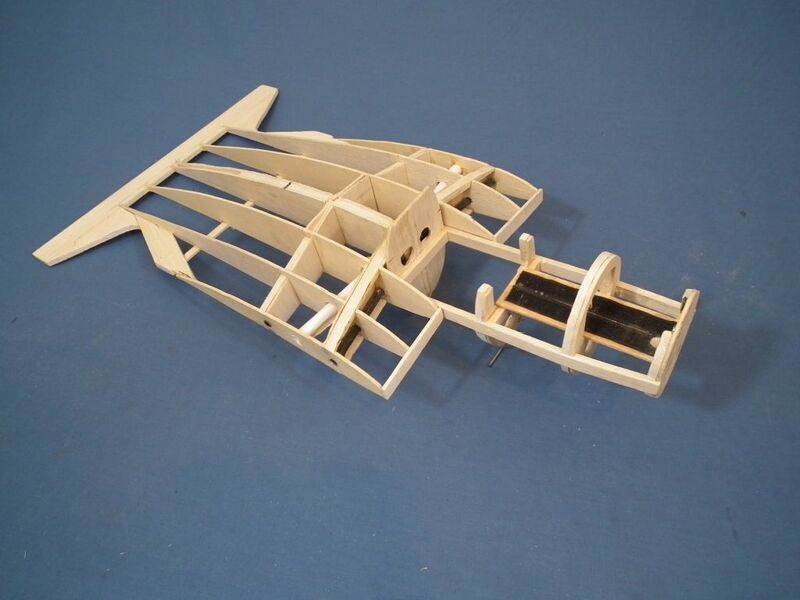 There are four carbon fibre tubes, two each side for the wing joiners. 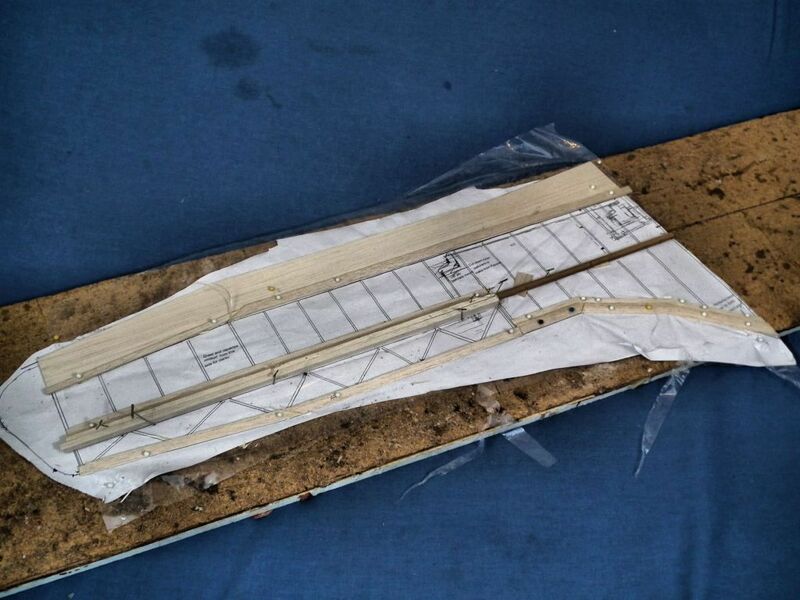 The white paper tubes between the spars are for the servo leads tothe ailerons. I am hoping just to feed the servo leads through to a Y lead in the cabin area. This is the front view with front carbon tube showing. The paper tubes need to be swept forward a bit more at the root. 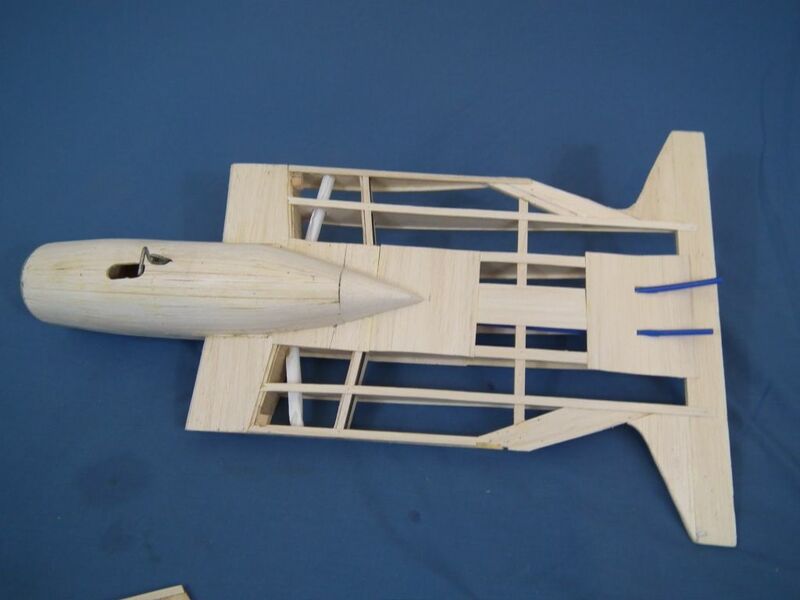 The fuselage pod is very simple. THe formers a re glued to the crutch. 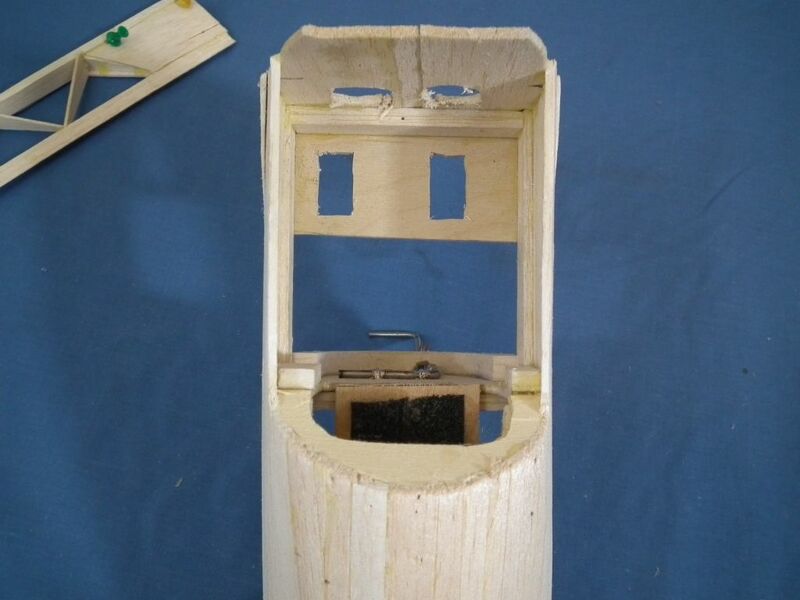 The ply formers have balsa edges to allow for pinning down the planking. 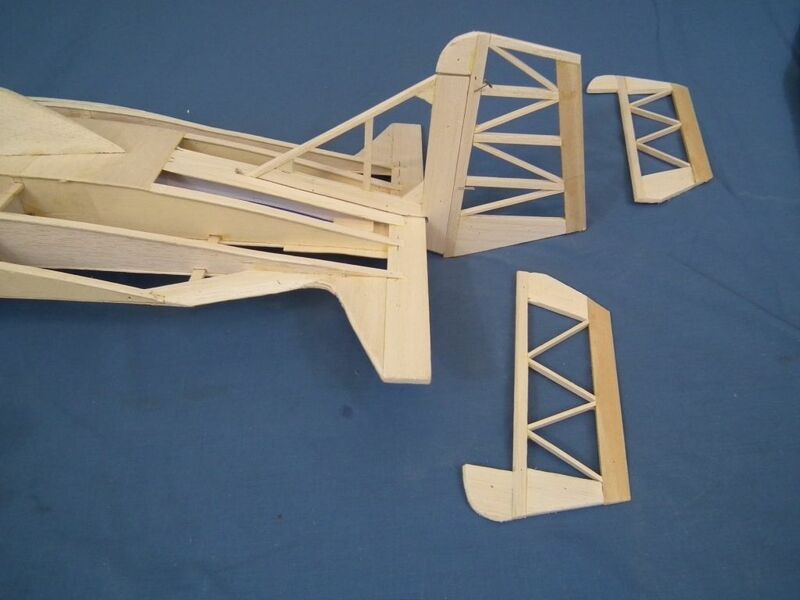 and also to give much more gluing area for the former with the undercarriage leg. The ESC will slide in under the motor and battery platform. 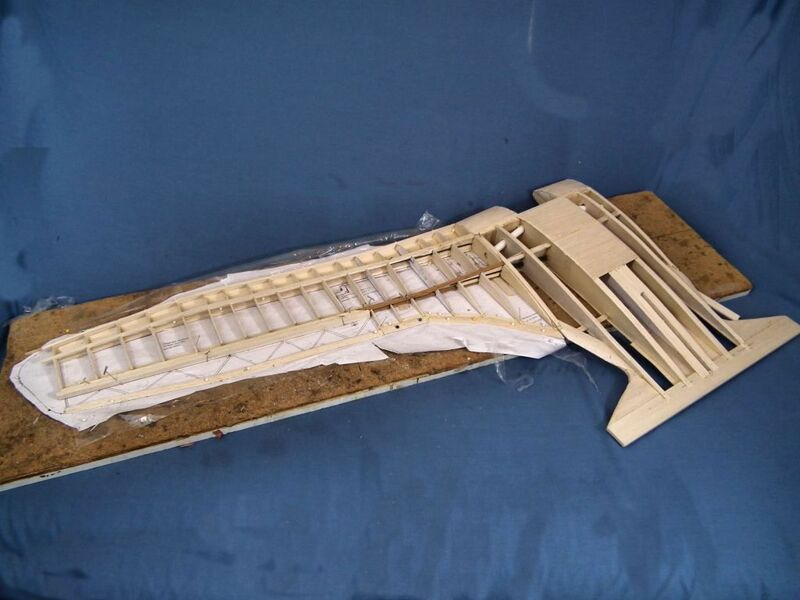 Top view of the pod frame work. The black is velcro on the battery platform. Not sure just how far forward or back the battery will need to be. 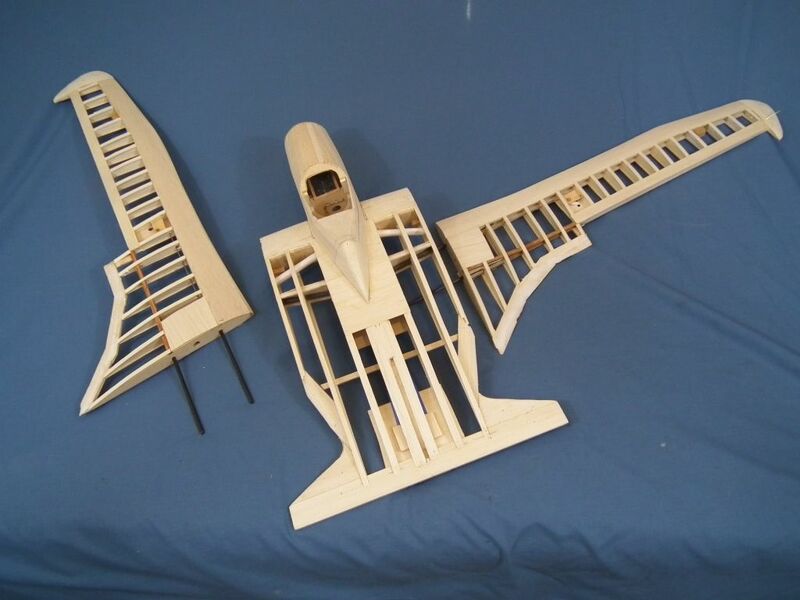 Dry assembly of the pod and wing. 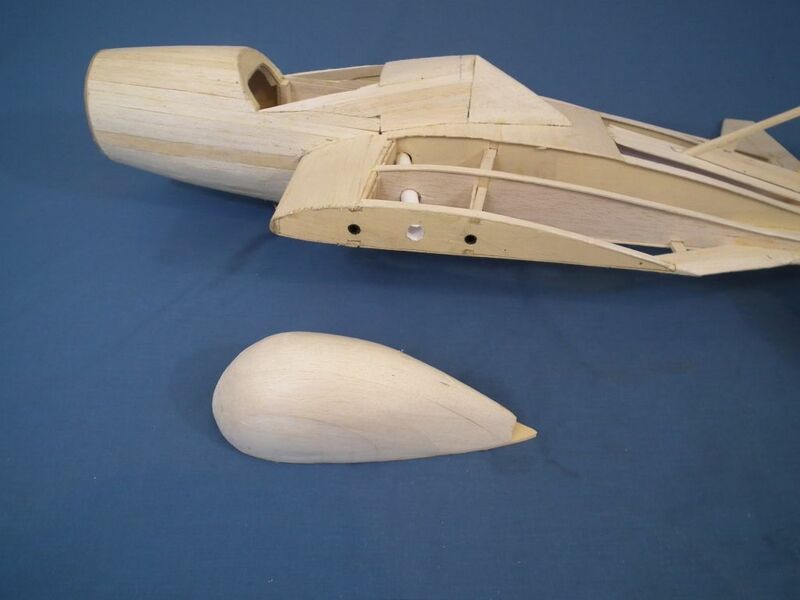 The pod will have some of the planking done before it can be glued on. Looking good Peter - I'm envious, mainly due to you being much further on than I expected, and much further on than I am!!! The last thing I want to do is copy your ideas, so I'll have to break out the thinking cap and come up with something all my own soon. I've been busy finishing off my latest effort over the past few days: I made all the transfers yesterday and fitted them today, so there's just one small hatch to modify and it's time for flying, if the weather improves. Really been slow progress as I have\ been so tired lately. No reason not to take ideas from other designs./ and especialy insist on refusing to take inspiration and ideas from elsewhere. Hope the test flights go well. No reason not to take ideas from other designs/and especially insist on refusing to take inspiration and ideas from elsewhere. More a case of adopt/adapt rather than actually copy in this case, I think, but your take on the Clark Y 'foil appeals greatly. That looks likely to happen. ... Clark Y or your preferred Naca 3414, Peter? 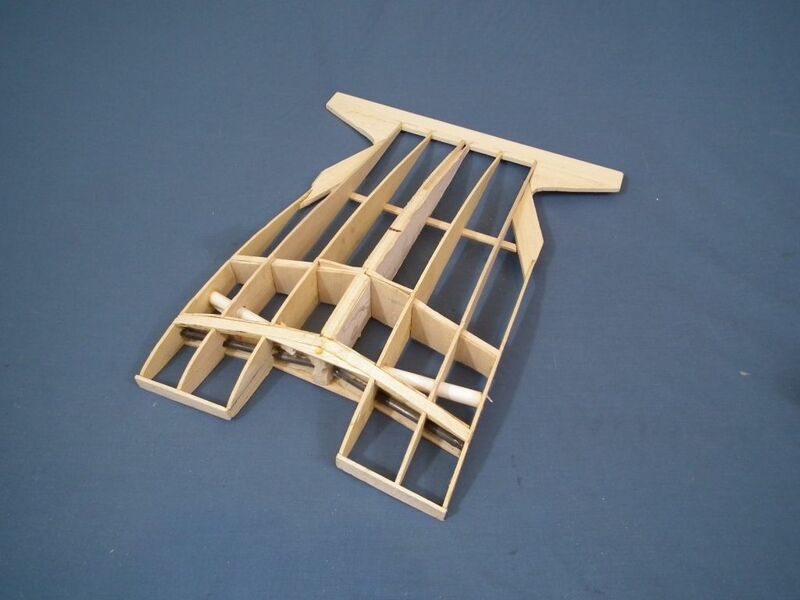 I remember a glider design in Flying Models. 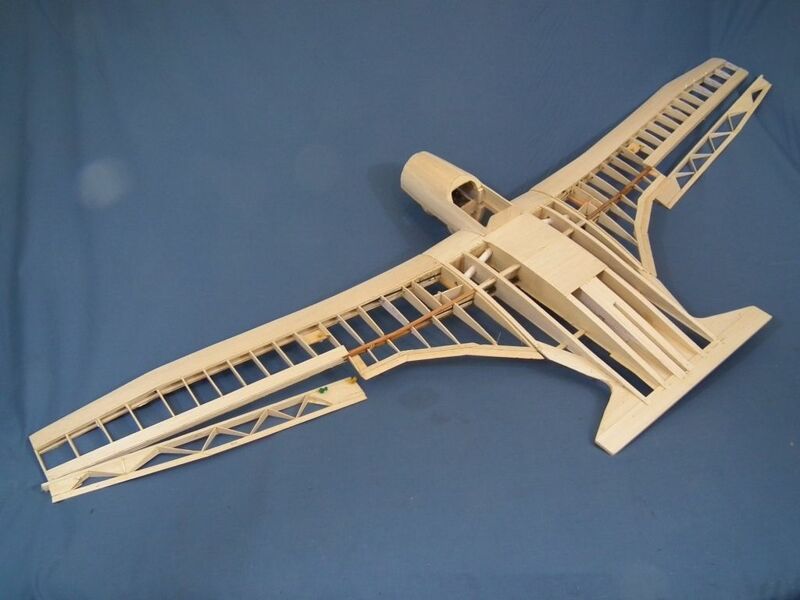 The chap was winning competitions and all the other competitors who were flying models with facy Selig and Eppler airfoils asked him what he was using on such a sensational winning desing. His answer was "Clark Y"
The wing is built flat onthe board. Stage one, all the spars laid down and lower L.E sheet. 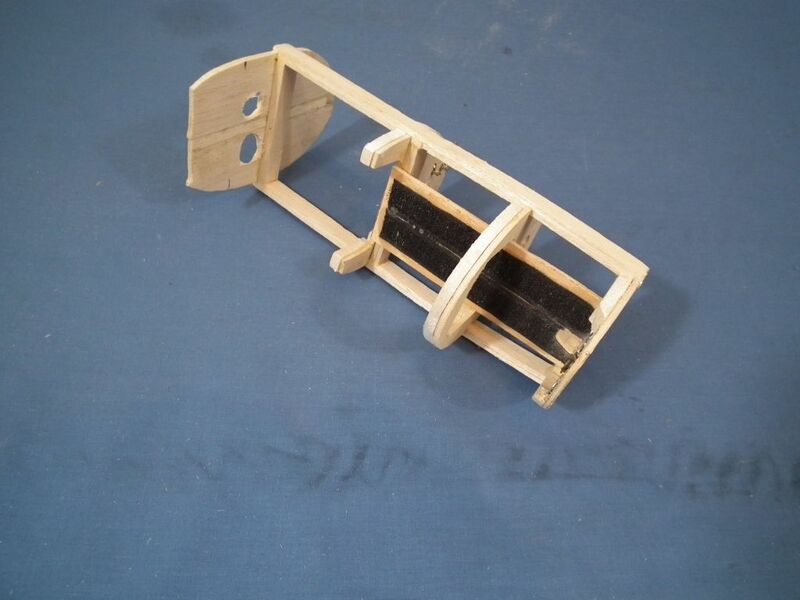 The trailing edge is a bit more complicated with some 1/16" sheet and the the trailing edge shaped from 1/8 sheet. 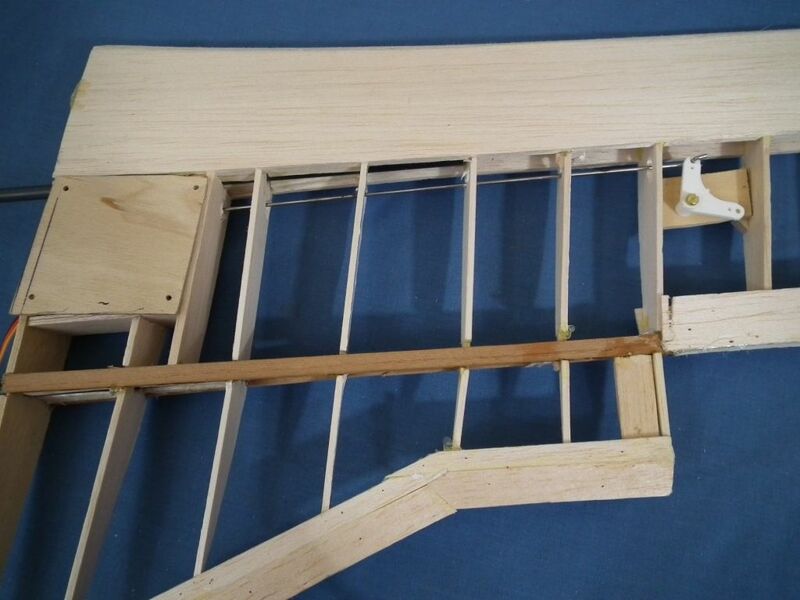 Rear spar is spruce as it doesn not have the suport of the leading edge sheet.. The 1/16 sheet reinforces the joints in the T.E. 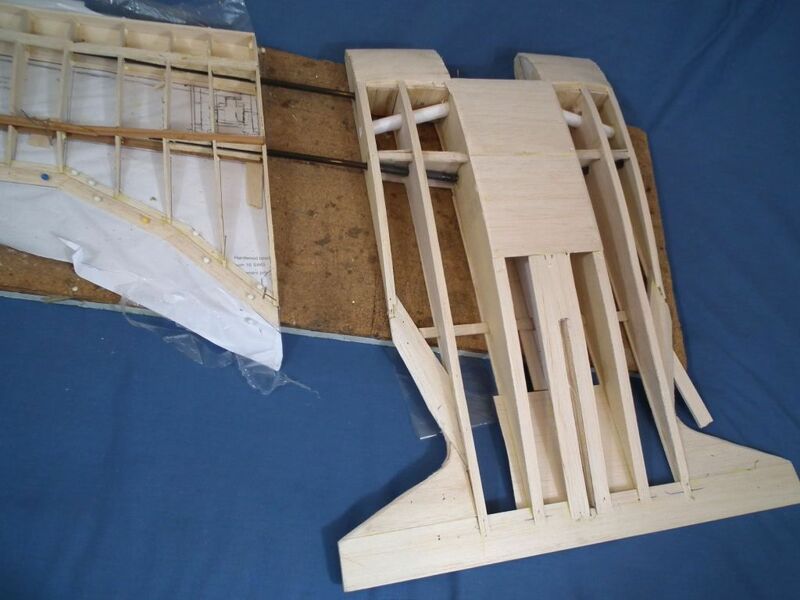 The centre section is propped up 1/8" on the side away from the wing being built. This will give the correct dihedral, about 1/2". 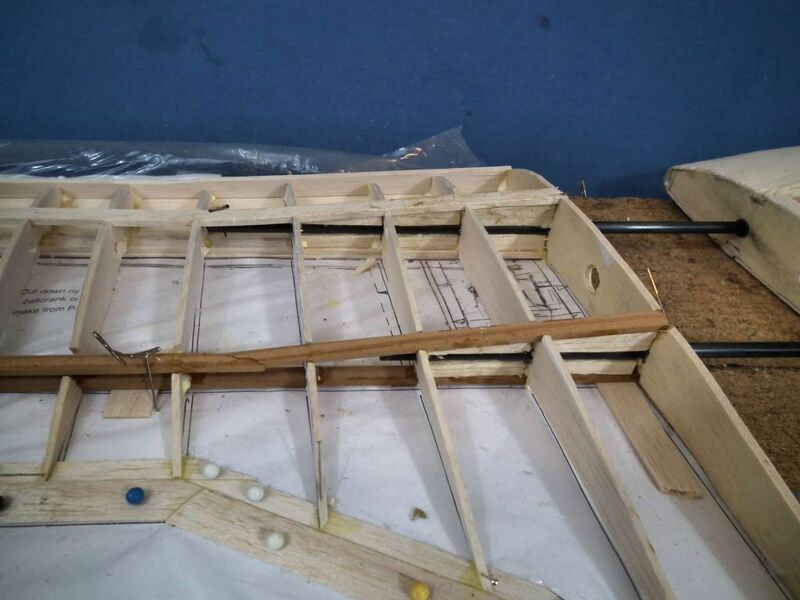 Then the ribs are fitted and the carbon fibre rods.. Apart from rib one the ribs do not give much support to the rods and indeed the holes have to be adjusted to get the rod properly aligned with the centre section tubes. Success,The wing slides into the centre section perfectly!! Miracles will nevexr cease. 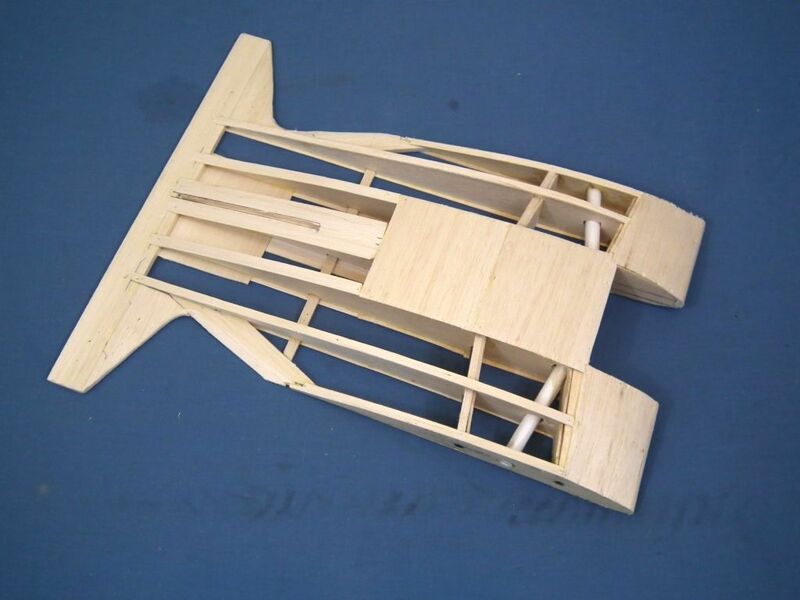 Now the rest of the sheet etc can be added and the aileron built. Coming along at great speed Peter. Faster than I expected. Just waiting for the disaster to strike!!! Wow, Peter - haven't you got anything else to do, like gardening, going to the pub, doing the washing & ironing, etc? Gardening???!!! I have about a 3rd of an acre of which 80% is pure jungle and I mean jungle. Even got the odd deer living in there at times. I occasionally mow the grass and wave a hedge trimmer over the worst bits. Pub? Nope I have a couple of tots before bed. Washing? it takes five minutes to stuff it all in the washing machine and another five to hang it on the line. Ironing? Nope.. I do cook proper midday meals. I even hoover a bit. Always know when it is time to hoover the stairs...when the balsa chips reach the bottom step. Mind you, I also build fast.That progress is done in about a couple of hours a day maximum. Right! Quite a lot of progress now. 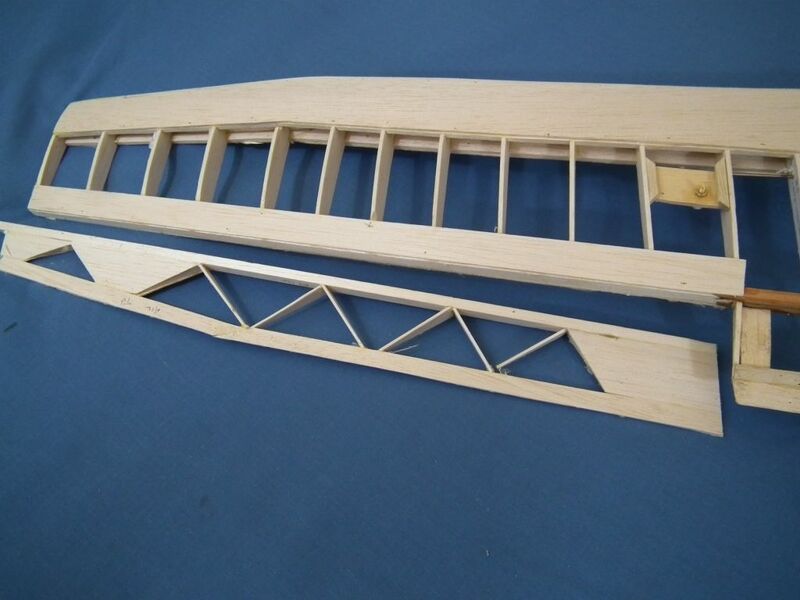 The top pof the fuselage pod has been planked. The bottom has not been planked as I need to align the crutch with guide marks inside the root ribs to get the correct angles. Inside the pod the mounts for the rudder and elevator servos have been fitted. With this model a lot of the installation has to be done on a cut and try basis. 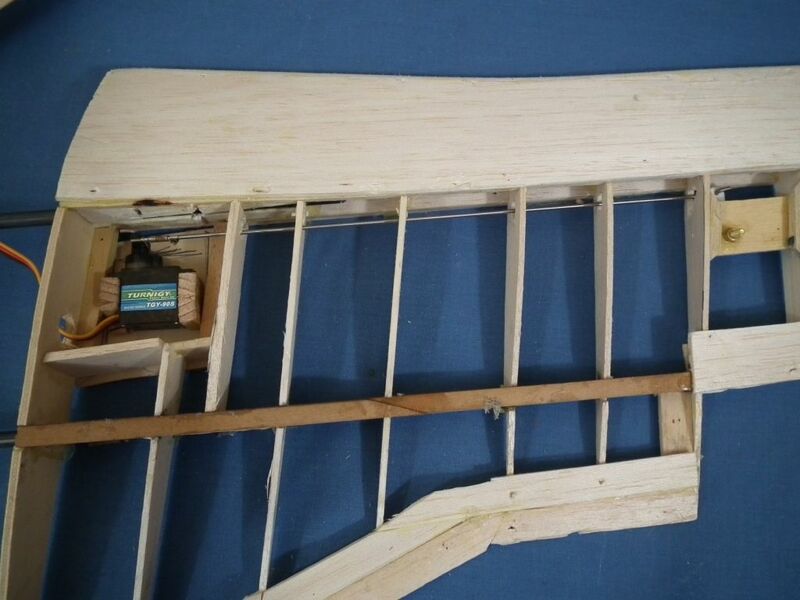 This is the underside view showing the hatch on which the aileron servo is fitted.. 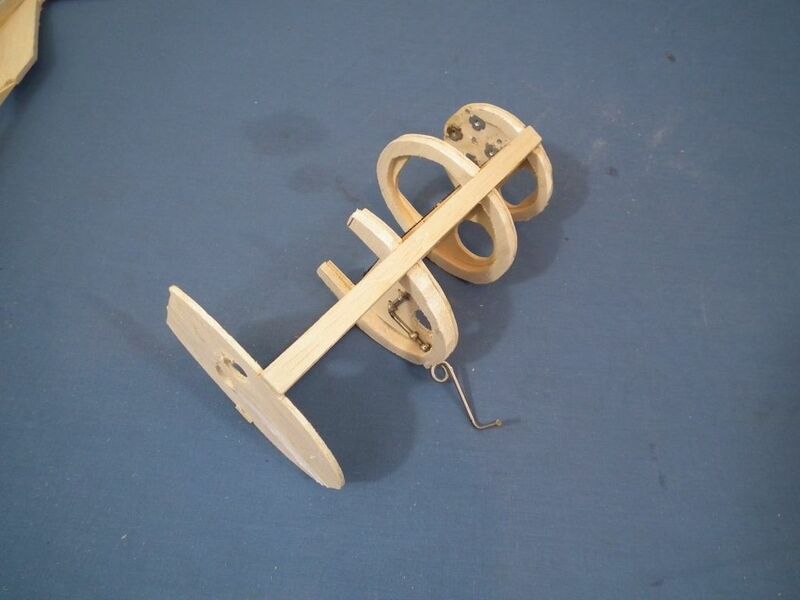 The bellcrank has been cut down by one hole to get it to fit. 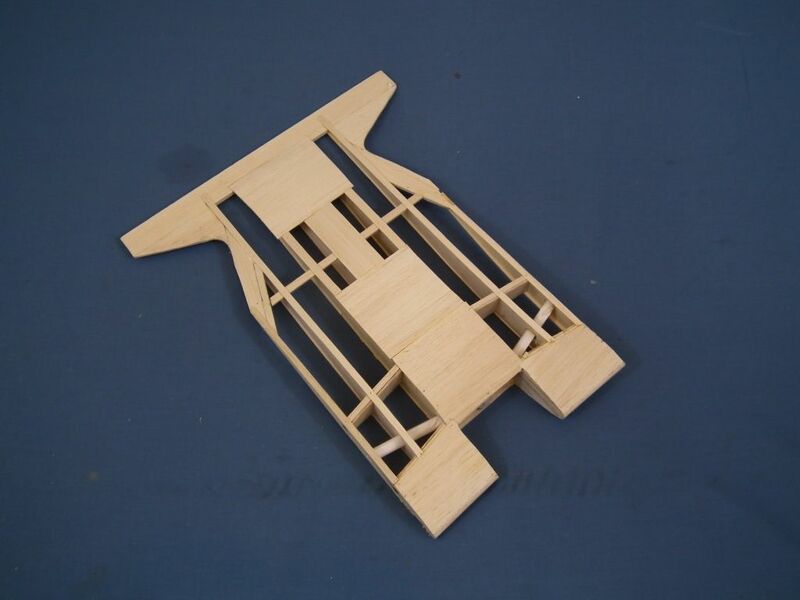 Top view of the aileron servo and push rod. It is a bit fiddly but it works well. 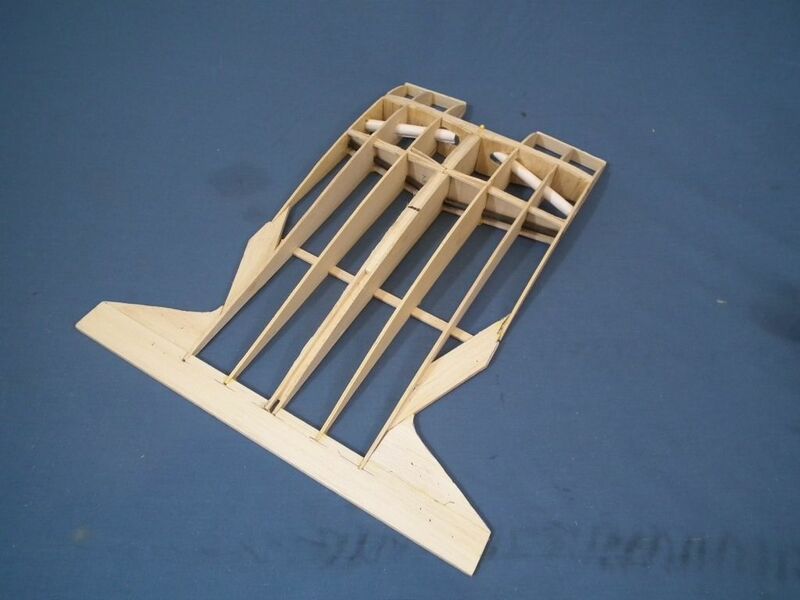 The wing panel with the aileron. 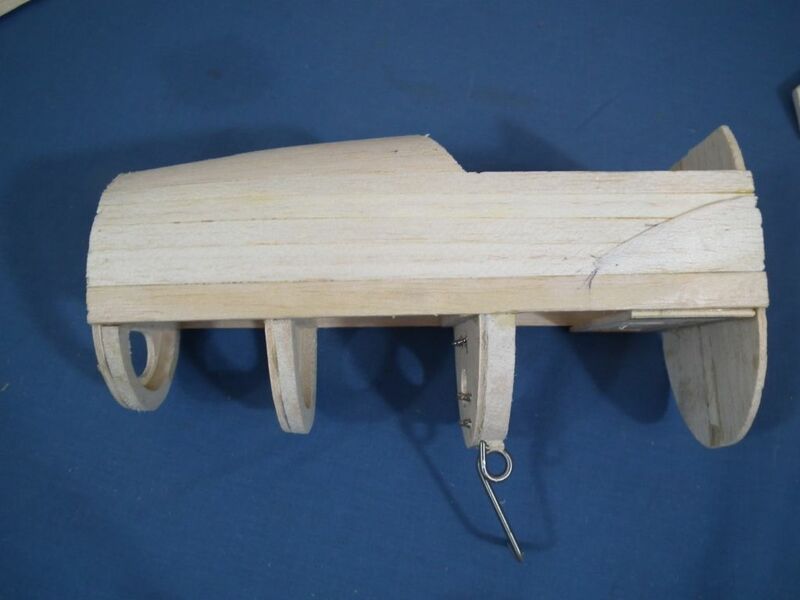 The sheeted areas are scale and are at the hinge and horn locations. I will add a central hinge. The pod has now been glued to the centre section. There will be another former in two parts glued to the centre secrtion and the planking wil go back to that. 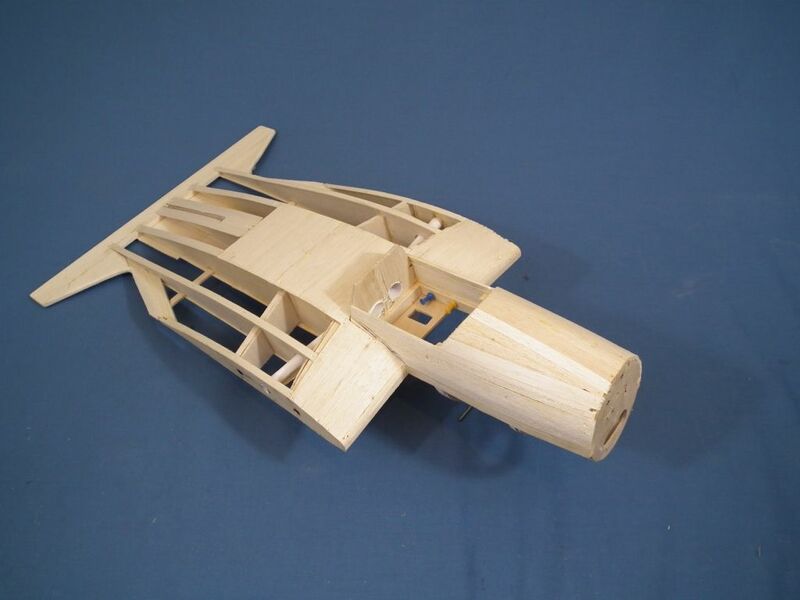 The extreme rear of gthe pod is made from small blocks. Starting to look very birdlike there Peter. Your building speed is still impressive, alas work gets in the way of my progress. Building speed is fast but not perfect by a very long way. However they fly well and don't fall apart in the air. They look good at 50 feet. The tail surfaces. These are pretty large but they are working with a very short moment arm. 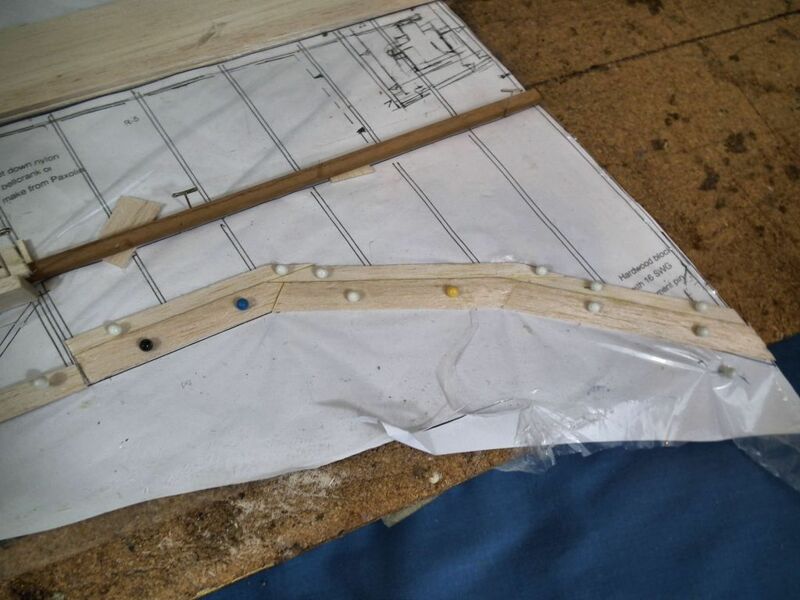 The pattern for the canopy took vast amounts of 1/2" sheet. It has been laminated and quite a bit is now in tne rubbish bin. Now for covering. I have only seen two photos of the aircraft. One was dark all over, the other is light coloured. I based my CO2 version an the dark picture and thought that red would be suitable for a Russian aircraft.